Take your brewing skills to the next level by attending our brewing classes! 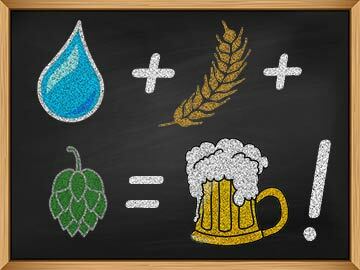 Our brewing school (located next to our shop in Walkerville) offers courses that will introduce you to the theory and hands-on practice of brewing beers from both malt extracts and from grains. The courses discuss many aspects of brewing, all of which will be explained in such a way as to be understandable to the novice. Q&A sessions and one-on-one discussions of various subjects of interest will also be part of the courses. The course material used is our own book, Home Bru'ing, a copy of which is yours to take home with you. Of course there will also be a few beers in the fridge at the end of the day! Note that the following is by no means an exhaustive list of the subjects covered in the course. 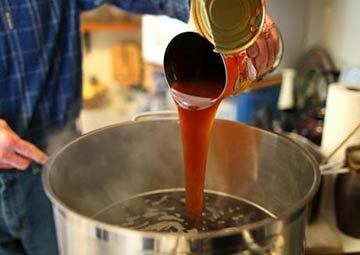 Many other aspects of brewing will be discussed and, where necessary subjects will be included on request. Both course days can be booked separately, however attending day 1 is a prerequisite for attending day 2. Having brewed at least one beer from a beer kit is highly recommended, but not essential. We will brew a beer from malt extract, speciality grains and hops, using only basic kitchen implements, discussing every aspect of the brewing process as we go along. 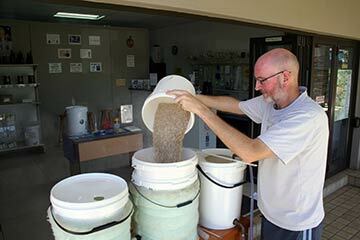 We will brew an all-grain beer using a three-tier brewing setup, discussing every aspects of the brewing process as we go along. Course 1: 4 May 8 June 13 July 24 Aug. 28 Sept. 2 Nov. Course 2: 18 May 22 June 3 Aug. 7 Sept. 12 Oct. 16 Nov. Please Contact us to book. We hope to see you soon!